With this San Francisco combo tour, visit Alcatraz Island by ferry during an evening cruise, and take an audio walking tour of the infamous former prison and get all-day access to the Aquarium of the Bay. Then head for the hills of Napa and Sonoma for a full day of wine tasting the following day. In tranquil wine country, you’ll taste award-winning Sonoma and Napa Valley varietals at four to six wineries, plus enjoy a gourmet picnic. This day trip by bio-diesel minibus also includes a vineyard tram tour at Benziger Family Winery to learn about bio-dynamic wine making. Your Alcatraz ticket will be arranged for the evening of the first day of your two day package (approximately 6:30pm for the night tour). Taking the ferry to Alcatraz will afford you amazing views of the Golden Gate Bridge, Angel Island, Alcatraz Island, and the San Francisco city skyline from the north. When you land on the island, you’ll get a short history of Alcatraz, and then head up into the prison! You’ll be equipped with an audio tour titled “Doing Time”, in which you’ll hear interviews from former inmates and learn more history about Alcatraz (available in 11 languages). 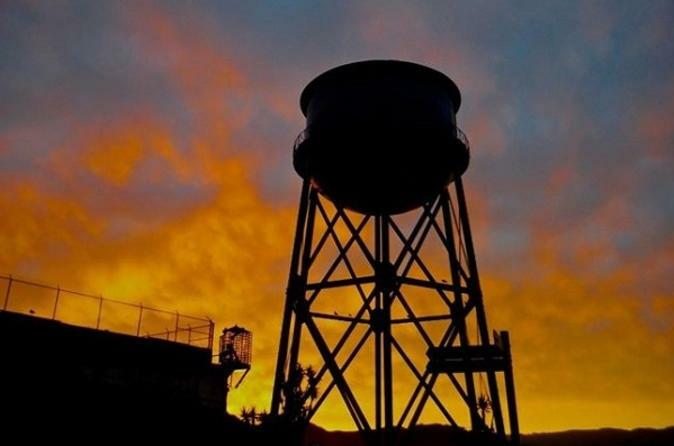 The Alcatraz Night Tour also includes special interpretive tours and access to areas of the island that are closed during the day. You may explore for as long as you want (the ferry departs for the mainland approximately every 30-40 minutes). The tour generally takes people about two and a half hours. Then, head over to the Aquarium of the Bay and use your all-day access pass. With a focus on education, conservation, and entertainment, it is the ONLY aquarium dedicated to the diverse marine life and distinctive ecosystems of the San Francisco Bay and its watershed. Your 10-hour day trip starts with hotel pickup in San Francisco. Head out of town with your guide aboard a bio-diesel minibus. As you cross the Golden Gate Bridge, enjoy panoramic views of San Francisco Bay and the city skyline. Making your way north to wine country, travel past Mt Tamalpais before arriving in Sonoma County, a region of vineyards planted along rolling hills and valleys that supply the world with renowned wines. Your first stop is Benziger Family Winery, where you'll hop on a tram for up-close views of the vineyards, fermentation facility and crush pad. This 45-minute tram tour allows you to follow the wine making process from roots to glass while you learn how wine is aged, bottled and distributed. Back in the tasting room, enjoy the fruits of these labors with a tasting of Benziger's award-winning wines, and then take a walk through the barrel caves to learn about bio-dynamic viticulture, an increasingly popular process that uses organic methods of farming without the use of pesticides and other artificial chemicals. Before you leave, you'll settle down to a deli lunch on a private picnic area. You'll have the option to indulge on a turkey, roast beef, ham, or vegetarian sandwich, accompanied by a pasta salad, piece of fruit, and cookie. In the afternoon, travel over to neighboring Napa County to continue wine tasting at three to five more wineries in Oakville, Yountville or in the city of Napa itself. On trip back to San Francisco, make a photo stop in the Marin Headlands above the Golden Gate Bridge before ending your day trip with hotel drop-off.